Our cabins are unique because they work in so many applications. From mom & pop businesses to corporations, Green River Log Cabins supports campgrounds, RV parks, luxury retreats, church camps, elder communities, or traditional subdivisions. 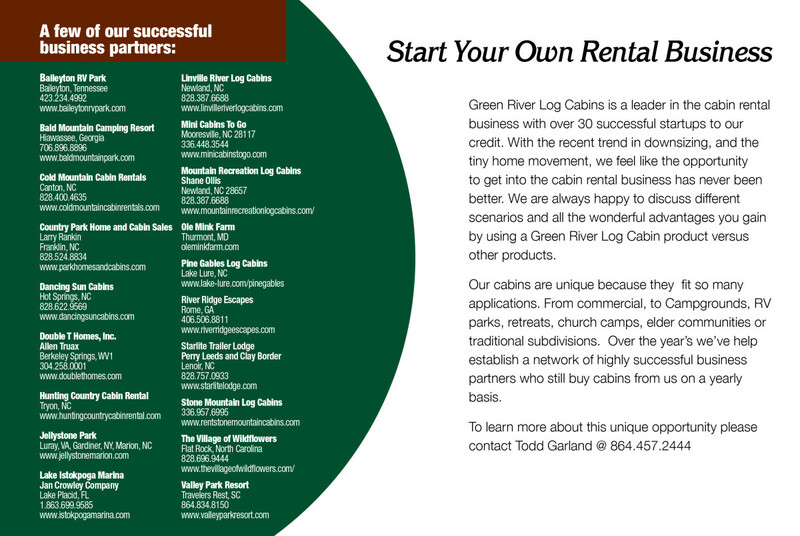 Our customers have more than 200 cabins in rental programs across the county. Over the years we’ve help to build a network of highly successful business partners whose cabins produce strong returns and who buy cabins from us on a yearly basis. With the recent trend in downsizing, and the tiny home movement, the opportunity to get into the short term and long term cabin rental business has never been better. We are uniquely qualified to advise owners on business planning, spreadsheeting cash flow projections, and some very advantageous tax treatment. We are eager to discuss different scenarios and all the wonderful advantages you gain from using a Green River Log Cabin to produce income for decades to come. Try before you buy…visit any of these fine establishments, and if you buy a cabin, we’ll reimburse you for one nights stay. We know you’ll love it!